When it comes to comic books I expect a fast read. Though, not so fast that the plot blurs by without having made any impression. I give James Bond: Vargr points for its action-packed sequences, but it loses many for not truly bringing me in and making me want more. After experiencing the thrill of a story like Brian K. Vaughan’s Saga, where every page had my mind racing to take in the world’s multiple layers, I have to say that Vargr was a bland, uncomplicated storytelling. Maybe just too transparent for one used to unpredictable plot twists, and tense action scenes. With the added bonus of sequential art, the gasp factor should still possible. Being used to Daniel Craig portraying a worldly, suave, and complicated Bond, I find that Ellis’ version of Bond is the vision of a more competent Sterling Archer. 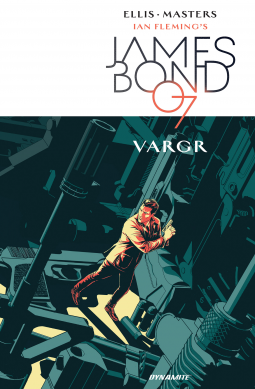 Of course, the illustrations depicting Bond no doubt turned my mind in that direction upon initial inspections of the book’s cover, but it stayed with me. However, I didn’t particularly care for that comparison when it interfered with holding on to the notion that this was supposed to be a story about a legendary 00 section agent, not an animated wannabe spy. All in all, I would still recommend this comic book to die-hard Bond fans. Maybe you’ll be more open and embrace Ellis’ take on the hard-hitting 007 agent.